Let the adventure begin! John is the best flying partner because he never gets stressed and always makes sure I’m fed haha. When I fly I always need a bag of Gardettos (original recipe of course) and a Starbucks/coffee. Never fails #airportessentials! As some of you may know I recently had my first trip to NYC for Fourth of July weekend! I got a ton of recommendations on things to do, places to see, and food to eat, however, was actually able to take the backseat in making decisions for this trip given I had a couple of excellent guides –> John’s parents. 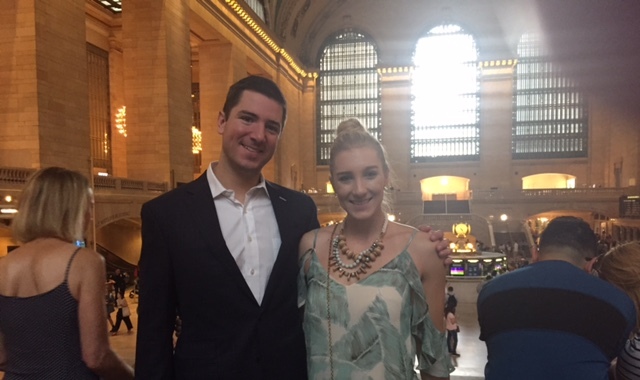 John’s mom grew up visiting NYC quite often throughout her childhood and John’s dad actually lived in NYC doing graduate work with NYU. As a result, they were the perfect pair to guide me through my first New York experience. John and I flew into LaGuardia airport which was about 20 minutes outside of the city. We then had a car pick us up from the airport and drive us into the city. This was much easier than trying to get an uber or taxi. 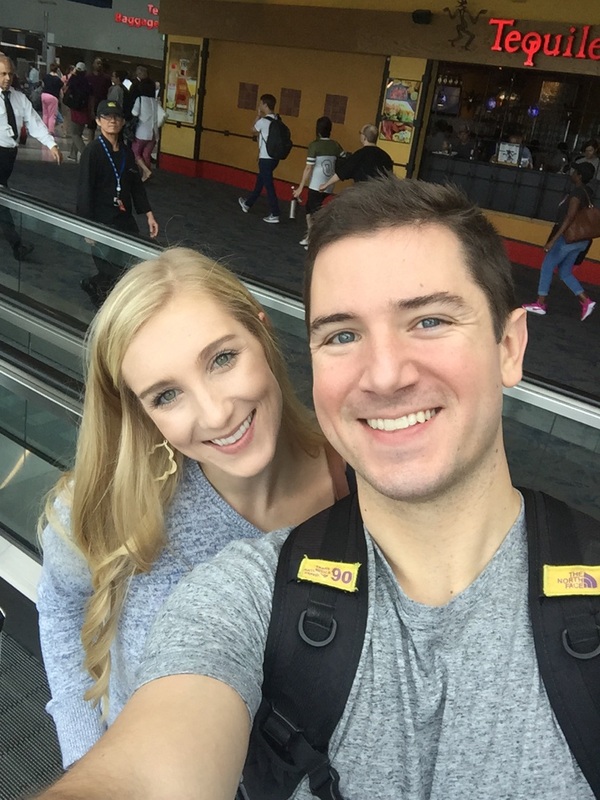 LaGuardia was cheapest for us to fly into, but there is also John F. Kennedy airport which is about 40 minutes outside of the city and is a much more common hub for people flying from the West coast. I would recommend avoiding flying in at rush hour times (7-9am and 4-6 pm) because you will probably be looking at much longer trips in and out of the city due to congestion. Flying out, we requested an uber, instead of booking a car, which was very easy and around $30. John’s parents always stay at the Bryant Park Hotel. 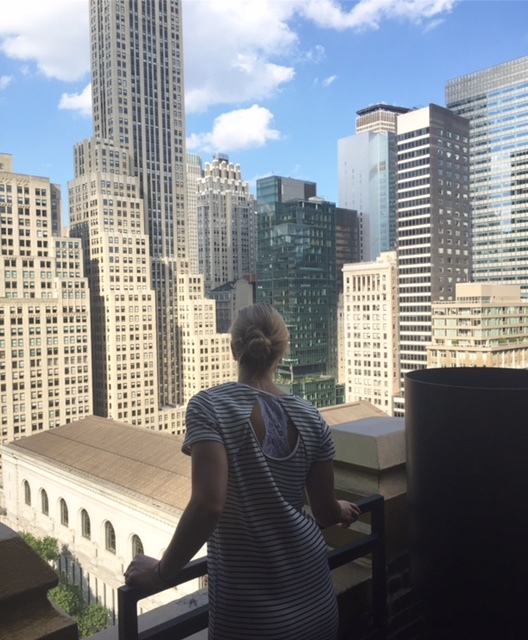 This hotel was perfect because it is located on the periphery of Bryant Park (and the New York Public Library), which is a beautiful park hosting restaurants, movie nights, and carousels. 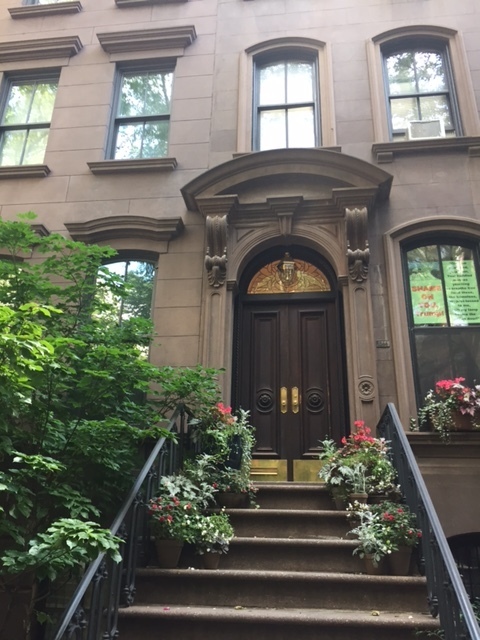 It was also only a couple of blocks from Times Square, Rockefeller Center, Fifth avenue shopping, the Theatre district, and much more. This made it the perfect location to see multiple things at once without having to get a taxi or uber to various places which saved us a lot of money. In fact, many of these places we saw just within an hour or so of leisurely walking and exploring. I also loved that this hotel had a gym for my daily workouts and was next to an amazing coffee shop called Blue Bottle Co ( I recommend the New Orleans, there draft latter). The staff here were wonderful and surprised us with a bottle of champagne to celebrate being newlyweds and were always quick to open doors, offer their recommendations, and carry up bags. View from our balcony at the hotel. This place was beautiful. 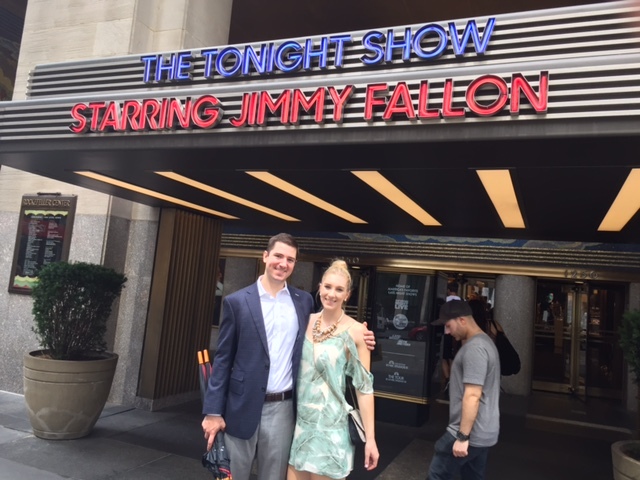 John and I outside of where they film the Tonight Show. We are obsessed with Jimmy! So I am personally not much of a sightseer. I prefer to experience places as a local versus a tourist because that is how you truly get the feel for a location. I love to immerse myself in the day-to-day life of a city or town and embrace its full character and charm. Plus, New York has SO many attractions that you could spend days trying to see it all. My recommendation is to pick one or two sites that you truly want to see, then, for the rest of your trip, allow the city to immerse you in its amazing sights, smells, and overall allure. I can promise you, the city will lead you where you need/want to go. The first day was only a half day, so we walked and explored most of the evening. Given our location, it was easy to see multiple places within our short 30 min walk before dinner. Including Rockefeller Center at night, Times Square, a couple of shops, and part of the Theatre District. We then headed off to dinner, which I’ll share later. 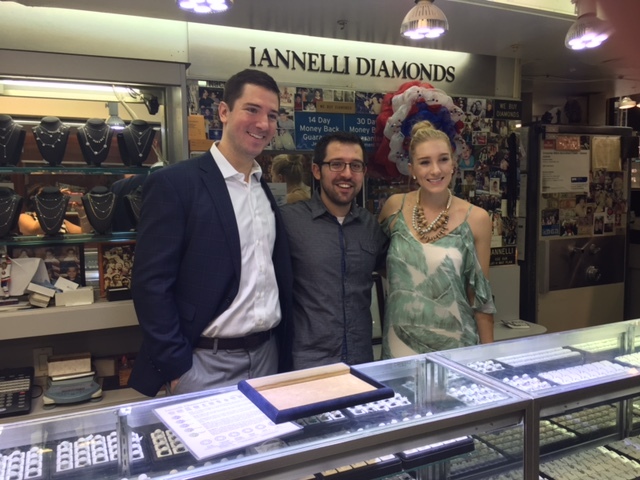 Saturday morning was spent walking the streets of the city (delicious pastry in hand), while taking photos in Grand Central Terminal, and gawking at sparklers through the Diamond District (I got to meet the jeweler that sold John my engagement ring! See below). 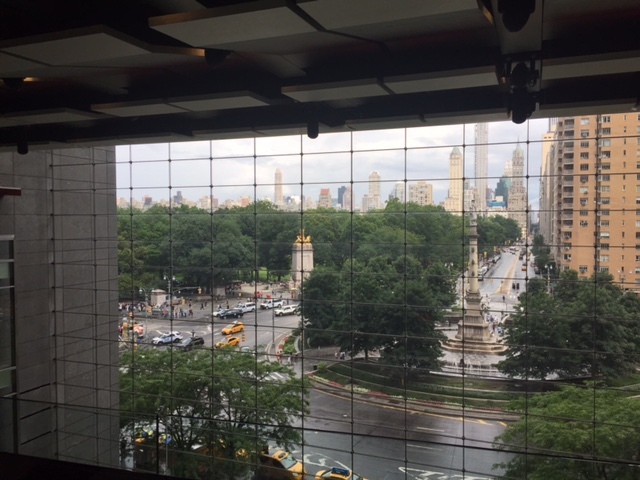 We finished our trip in Columbus Circle for lunch. The afternoon was spent cruising Fifth Street, stopping into the Plaza Hotel (highly recommend making a reservation for high tea here), galavanting through the 10 floors of Saks Fifth Avenue (Yes TEN!! 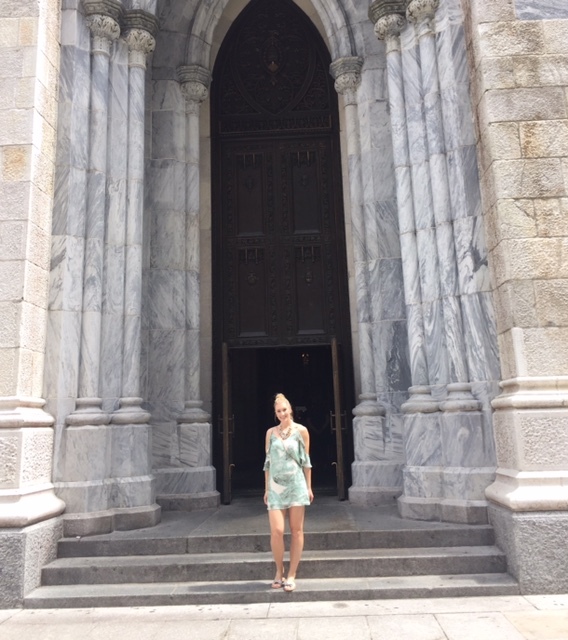 ), and stepping into the largest Roman Catholic Cathedral in the United States, St. Patricks Cathedral. We then rounded out the day with dinner and drinks. Sunday was just as eventful! We started the day by doing some more shopping on Fifth Avenue (the entire street is shopping and is MILES long), then headed down to Greenwich Village to meet a local friend for lunch. We then explored Greenwich (including stopping to see Carrie Bradshaw’s apartment) and Soho, only to stop for the most amazing milkshake I’ve ever had. The night ended with pizza and a Broadway show. We saw Cats, which was AMAZING! If you don’t like Cats, there are plenty of others, all within walking distance from the hotel, that will most likely suite your fancy. Regardless, definitely GO SEE A SHOW! Monday we left with our feet aching and our heads swung low. New York, you stole my heart. Now this, is my MOST FAVORITE part. I am 100% a foodie and always have been. I am also hungry, basically every hour, but thats another story. Regardless, food in New York is sensational. Every where you look there is a restaurant you want to try and every one you do try, the food is amazing. We were lucky enough to experience food like kings and queens, but I honestly don’t think you can go wrong when deciding what to have. New York is definitely one of those cities where if the food isn’t good, the restaurant won’t last. Friday night we went to an amazing Armenian restaurant. John’s mom is Armenian and as a result, the Armenian culture is very important to John and his family. Both of John’s parents and his sister have had the amazing opportunity to travel to Armenia and experience the wonderful culture first hand, so to be able to have authentic Armenian food was a real treat. Almayass is located on 24th street and was opened in 1996 by third generation Armenians. The food is meant to be shared and comes in small plates. The server will help you order, but essentially you start with multiple cold and hot appetizers and then move towards a couple of entrees for the table. Don’t be fooled by the descriptions, you honestly can’t go wrong. Just be sure you order the Knafeh or the Ossmalieh for dessert though! Saturday, we were lucky enough to eat a Three Star Michelin restaurant (there are only 14 in the United States) for lunch. Per Se was perhaps one of the most interesting culinary experiences I have ever had. There are only two options on the menu, meat or vegetable and from that decision on, you are taken on a sensory journey that you will never forget. This restaurant is very expensive and it is recommended to make reservations at least 30 days out, however, I 100% think it is worth the experience and cost. If you do go, be sure to dress to impress and I recommend trying it for lunch instead of dinner because it will save you a little bit of money and may be easier to get reservations. Dinner that night was then held at Peter Luger Steakhouse in Brooklyn. Another, phenomenal restaurant, but with an entire different vibe. Much more casual and much heavier meal. As the name suggests, they specialize in steak. It is family style serving and served as steak for one, two, three, or four. The portions are massive, so I would suggest ordering down by one “person” (for example if there are four of you, only order for three). By the end of the night, I was full, happy, and ready for bed! Sunday was a little more relaxed in regards to food. Breakfast was on the go (bakeries, bakeries, and more bakeries) and then for lunch, we had Rosemarys in Greenwich Village. This location has a garden on its rooftop and uses mosts of its ingredients fresh and home grown from its own garden. 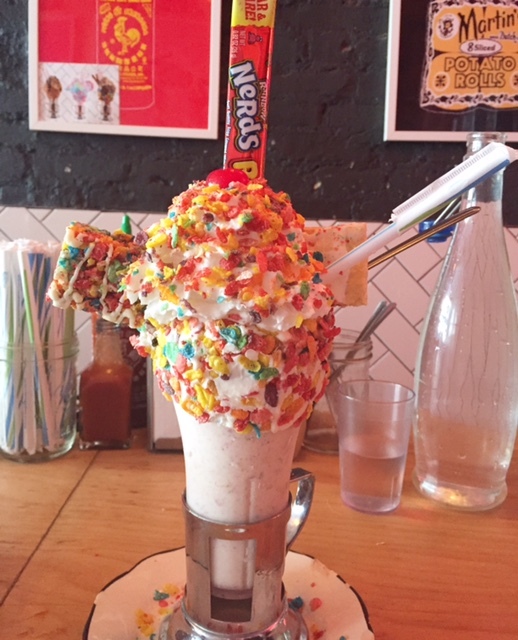 We then had the most amazing milkshake of our lives (see picture below) at Black Tap . Be prepared to wait in line regardless of location. It took us about 20 minutes, but the wait can be much longer depending on the time you go. Dinner was then spent chowing down on pizza in the theatre district at John’s Pizzeria. Talk about some of the best pizza you have ever EATEN! OMG> The wait can get long here, so it may be best to go during an off time, but get ready to do some work, because it is bomb.com. Appetizers are served family style, so be prepared to share. The location in Times Square is also pretty cool because it is an old church. The pizzeria has done a great job at preserving most of the old character, which makes this delicious meal a total experience. Well I hope enjoyed my travel guide! Let me know if you take me up on any of my recommendations and I can’t wait to go back to the city that never sleeps!